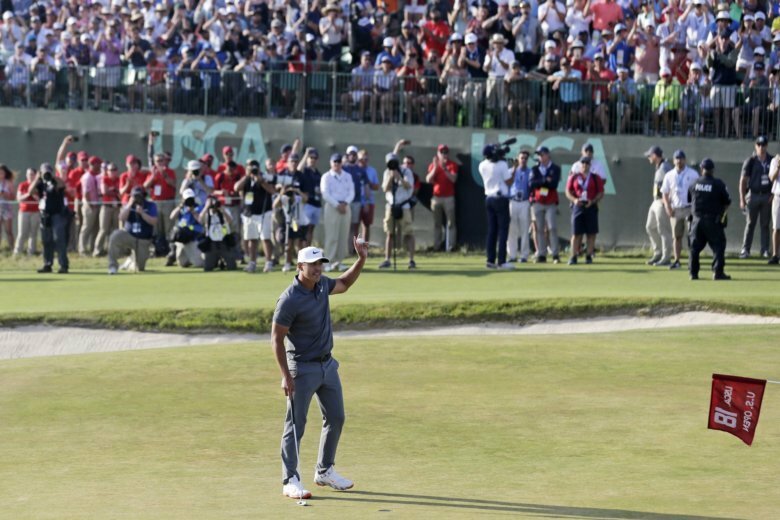 Koepka captured his second major Sunday. It would not have been possible without his 72 on Saturday in conditions so severe the last 45 players to tee off in the third round didn’t break par. The USGA conceded the course was over the top and pledged to get it right for the final round. Stuart Manley closed with a 3-under 68 and beat Grant Forrest with a par on the third sudden-death playoff hole in the Hauts de France Open on the European Challenge Tour. Forrest also shot 68. … George Cunningham won the GolfBC Championship for his first Mackenzie Tour-PGA Tour Canada title. The former University of Arizona player finished at 20 under with weekend round of 62 and 64. Zach Wright and P.J. Samiere tied for second, two strokes back. … Motin Yeung became the first player from Hong Kong to win on the PGA Tour Series-China, shooting a 6-under 65 and winning the Kunming Championship with a birdie on the first playoff hole. Yeung beat Callum Tarren and Josephn Gunerman in the playoff. … Sang-hyun Park won the KEB Hana Bank Invitational on the Korean PGA Tour, shooting a 5-under 67 for a one-shot victory. … Clark Dennis won the Senior Italian Open for the second straight year, beating Rafael Gomez in a playoff. Ji Hyun Oh closed with a 6-under 66 for an eight-shot victory in the Kia Motors Korea Women’s Open Championship on the Korean LPGA Tour. … Ai Suzuki won the Nichirei Ladies in a three-way playoff for her fourth victory this year on the Japan LPGA Tour. … Isi Gabsa of Germany won the Forsyth Classic for her first Symertra Tour title, beating Jillian Hollis with a birdie on the fourth extra hole.